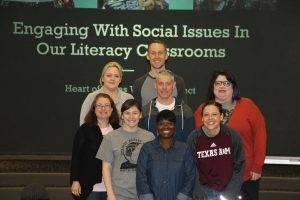 We partner with Austin area districts and schools to provide on-going professional development in the teaching of literacy. Our partners benefit from on-site inservice which includes workshops, model lessons and curriculum development in collaboration with teachers. Heart of Texas Writing Project is a network of Teacher Consultants who are experienced in designing and leading workshop series for Austin area teachers in the teaching of writing. We strive to design in-depth professional development that is responsive to teachers and supportive of their growth in process writing pedagogy. Heart of Texas Teacher Consultants work together with schools and districts to design workshop series that meet the needs of teachers. These workshop series are designed with the goal of engaging teachers in on-going professional development and to build leaders in the teaching of writing. 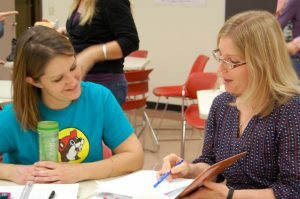 Click here to find out more about the professional development we provide to Austin area schools. Contact Deb Kelt to design a professional development plan for your school or district. Many Leander ISD teachers, like those pictured here, maintain active engagement with the Heart of Texas Writing Project as Teacher Consultants and through participation in our Saturday workshops.